Caverns of Doom figures, rebased etc. I started this blog, lo these many weeks ago, to document a project of recreating the Caverns of Doom and the Sorcerer’s Crypt. As I sought out information to fill in some gaps (Ihad lost some of the rules sheets and discarded the boxes, which had the character and monster stats in the case of the Sorcerer’s Crypt. I found Scottsz’s Sorcerers of Doom project and was so impressed with what he was up to that I thought I’d start my own blog. That’s when I put up most of the “static pages” too, as I was figuring out how blogs work. The Caverns of Doom page just shows the map. You can see some older, blurry pics on the Caverns of Doom post here. So I touched up a few of these guys, and rebased them all on dungeon black. I still have a few other original Heritage figures that came with the set to paint up, but in the meantime I’ve got similarly old-school stand-ins for the rest. 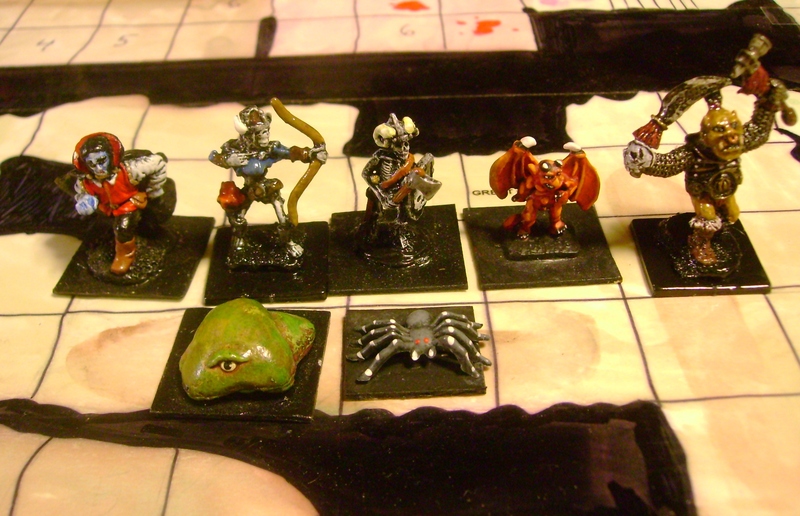 Left to right, a Grenadier wizard, a Prince August elf (cast from a mold), a Grenadier cleric, a TSR barbarian (the original figure in the set is a “barbarian woman”), a Heritage paladin, standing in for the knight, and the original thief figure, still one of the best D&D thieves I’ve seen. They are standing on the map I made. A slightly better shot of the wizard. He is clearly using some sort of protection scroll, as it is pointed at his opponent! Some of the monsters. not pictured: the rats. 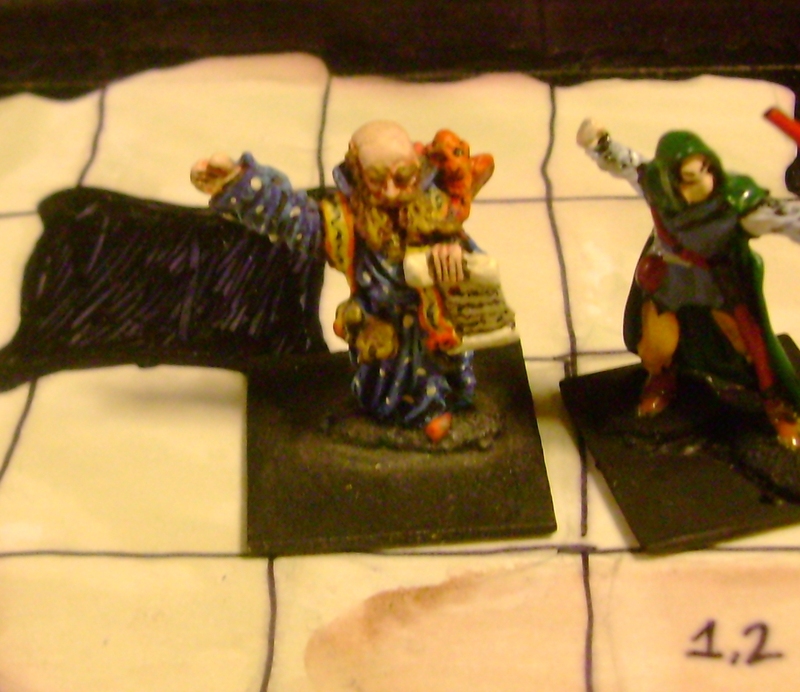 I have three of the original four rats, but usually use some plastic rats from the Heroquest game. Back row, left to right, Grenadier vampire, original Heritage skeleton archer, Grenadier skeleton, original Heritage demon, a Standard Games mon-ogre standing in for the hobgoblin. Front row, a Grenadeir slime and a spider made from a dollar store toy (you can get bags of dozens of these little glow-in-the dark spiders at Halloween…). 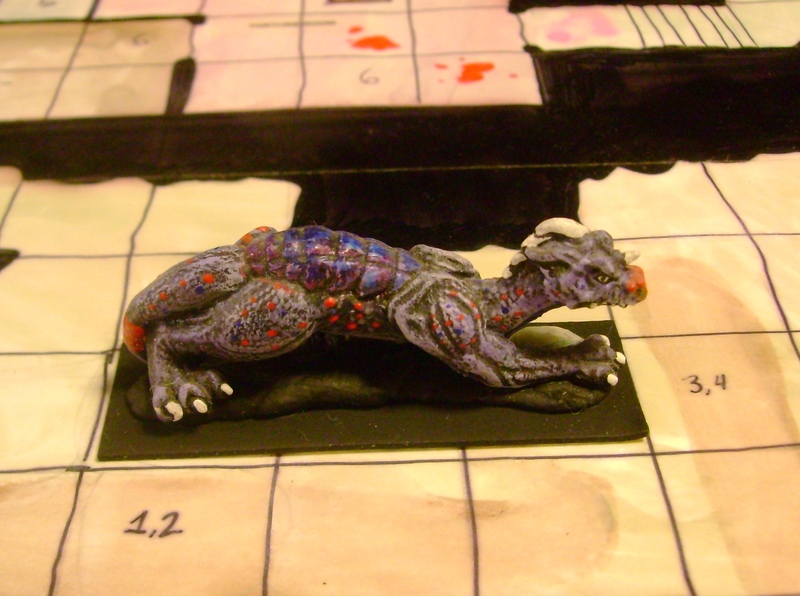 But the Caverns of Doom are deadly because of the Dragon most of all. My Heritage dragon is mostly MIA (I still have the body section but not the head, wings, and tail!). so I use a Grenadier that is the right size (3″ long) to fill the three squares. Quite feline, actually. 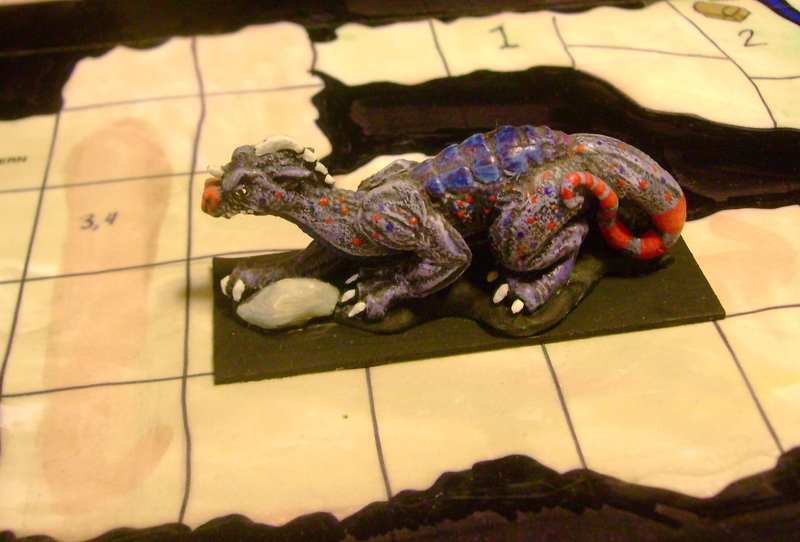 This dragon is clearly the stalking kind. I don’t like how the striped tail turned out but otherwise I’m happy with him. Sweet Jesus, that is absolutely mouth-watering! Thanks, Scott! You are always so kind.